In the New Forest, the First World War ushered in an era of intensive military activity as wide open spaces, common land, varied terrain and a relatively sparse local population attracted both the army and the nation’s fledgling airforce. 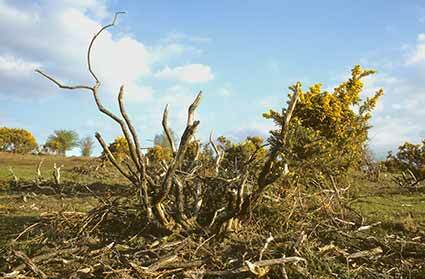 At White Moor, a short distance to the east of Lyndhurst, soldiers camped before embarking for the fronts, leaving behind, deep amongst the heather, the remains of trenches used for warfare practice, simulating the unenviable mud and squalor that soon would be faced in action. Indeed, the west window of the Catholic Church in Lyndhurst commemorates some of these men, soldiers of the ‘Immortal 7th Division’, who in 1914 camped on White Moor and Lyndhurst’s old Race Course, and were billeted with local families. In October of that year, 15,000 sailed for France, heading for the battlefields of Ypres. Three weeks after going into action, only 2,380 were still alive. 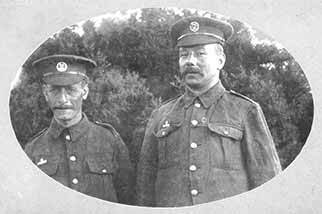 Similarly, Miss Cavill recalls volunteers leaving Lyndhurst: ‘It was a very sad day when the volunteers left for the First World War. We lined the side of the road and my mother sat me on the field gate, now the Enchanted Tearooms (in 2008, the Enchanted Tearooms are an Italian restaurant). There were lots of hugs and kisses and tearful farewells and I doubt if many of those men came back’. An old photograph of the Bombing School ‘Class of 1916’ shows seated in the front row, the son of Sir Arthur Conan Doyle, who lived nearby at Minstead and is buried there in the churchyard. The photographs above showing 'Soldiers from the camp on White Moor' recall those days. The first is from a contemporary postcard written by ‘1756 Private William White’, who gave his address as 3 / 4 Hants Regiment Cookhouse, Lyndhurst Road Camp, Lyndhurst. 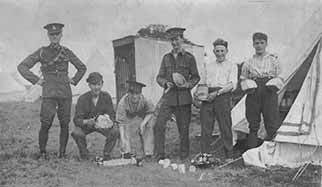 The lower picture is from the same source and presumably shows men of the cookhouse relaxing in what was probably a short-lived break. Evidence of war is still occasionally unearthed. 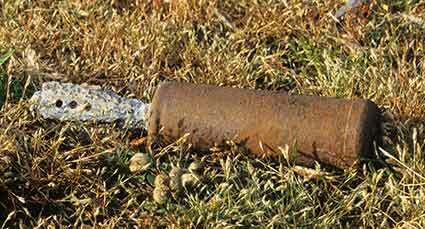 Not very many years ago, during the construction of a new house in the garden of an older property adjacent to White Moor, an unexploded grenade was discovered. After being placed in a blast-proof box, it was taken onto the Moor and destroyed.